I was asked recently about my views on personal prophecy. We all know this trend within the Charismaniacal churches. Often an itinerant "prophet" will visit a church and give a short teaching followed by the laying on of hands to anyone who wants a "word from the Lord." This word is usually suspiciously vague or extremely personalized. The vague prophecy is often about some great move or shift in the atmosphere that you will be able to move into with some kind of mantle or anointing. The personal variety is often "God showed me" that you will do great and might things in ministry, attain some personal strata you seek after, or expand your territories. 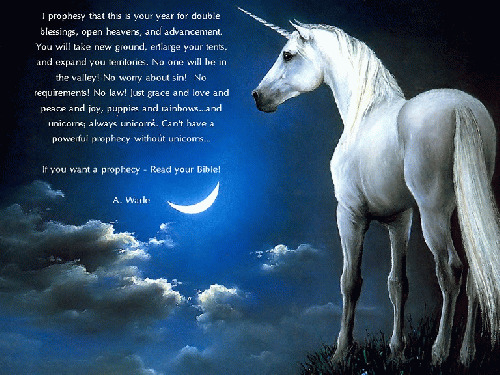 Just as feel good sermons are designed to scratch our itching ears, so are such "prophecies." These are the words of Moses explaining the process Israel must follow once he is no longer with them. They had relied upon his direct words from the Lord since their exodus from Egypt. So he explains that the Lord will raise up another like him who they must listen to. He then explains how to differentiate between the false and the true prophet and the test was always accuracy. If someone claims to speak a prophecy that does not come to pass then you must conclude that this person has spoken presumptuously and can be dismissed as a false prophet. No oopsies and do-overs. Sound harsh? Not at all when you consider that claiming to speak from God is a pretty serious matter. Does God stutter? Is He ever wrong? The answer is an obvious no, so anyone claiming to hear from God who speaks falsely should not be listened to -- period. Beloved this standard has not changed to this day. If someone claims to be hearing from the Lord the only true test is 100 percent accuracy. We should expect nothing less. This is summed up nicely in the first half of our key verses today. Long ago, at many times and in many ways, God spoke by the prophets. Note the delineation that God makes here through the writer of Hebrews. While this is what occurred long ago, things have changed now in these last days. Does that mean the nature of prophecy has changed? No. Prophecy is clearly marked as a gift of the Spirit and is still the same thing. It means thus sayeth the Lord and it is still to be judged via 100% accuracy. No beloved. What has changed is the mechanism that God now speaks to us through. Whereas in the old days it was via the prophets it is now through His Son Jesus Christ. Note however the past tense usage. In these last days He HAS spoken to us by His Son. This is the Word of God. God has revealed His will for us through His written Word. There is no longer any reason to go chasing a word from the Lord when He has already given us His Word! Do we think God has forgotten to say something? Do we honestly believe that God wrote down the 66 books of the Bible thousands of years ago but now in 2017 just realized something He meant to say? No. As He used to speak through the prophets He now has spoken to us through His Son as reflected in His Word.